So here I am at day 365 of my photoaday project. Mostly its been a good project to do, and I’ve easily found things to take photos of and upload. I’ve had the idea for this one for a while but shot it tonight – Almost every day I’ve managed to take photos, especially in the beginning, but since I got to 300 its been a real struggle – I’ve had other things going on in my life and some days I’ve completely forgotten. Its easier if someone else is doing it too. 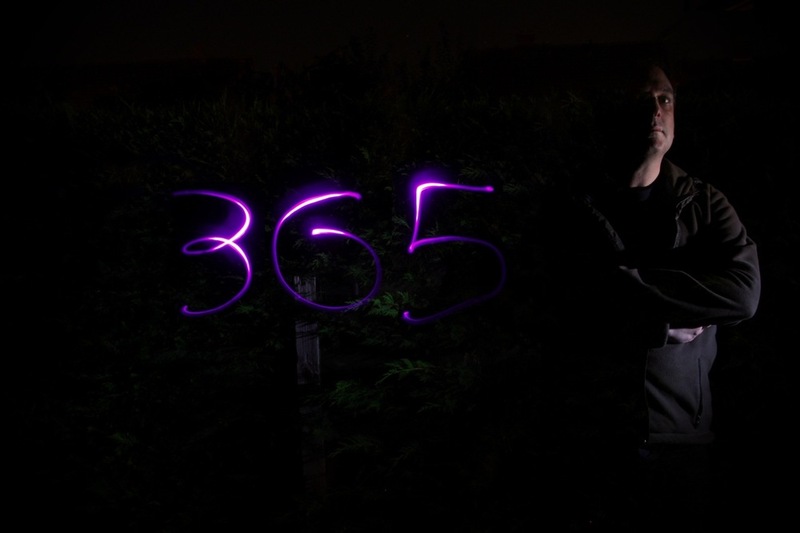 Its jolly hard to write 365 backwards in the dark and the cold when you are trying to take a photo on your own. Shall I carry on? I should do – but I might not be as disciplined if I miss a day from now on. Of course that could mean I miss a week and just don’t continue. I’m going to take a break anyway – until I see the next photo – then I might start up again. Maybe it might be better to start again from Jan 1st 2012. I’ll see. This entry was posted in Uncategorized and tagged photoaday. Bookmark the permalink. Congratulations! You did a great job and I really enjoyed looking at your photos.